Provide comfort for the family of Lathel Guy with a meaningful gesture of sympathy. Minister Lathel “Gee Gee” Pettitt Guy, a long time resident of Mt. 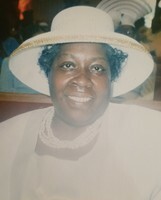 Vernon, Al, gained eternal life on Saturday, March 16, 2019 at her home surrounded by family. Born October 25, 1945, she was an ordained Minister at Pine Grove Baptist Church where she lead the prison ministries, served as a faithful Usher Board member, and a dedicated Mission Board Member until her passing. She was preceded in death by her loving husband, Dea. Clayton Guy, Sr., her parents, Ben and Elma Perkins, and her middle son, Louis Pettitt, all of Mt. Vernon, Al., two brothers, George Perkins, Mt. Vernon, Al, and Michael Perkins, Mobile, Al. She leaves to cherish her loving memories, two sons, Sone (Kimberly) Pettitt, Mobile, Al and Lorenzo (Stacey) Pettitt, Sr., Mobile, Al., one daughter in law, Felicia Pettitt, Mt. Vernon, Al, one loving and devoted god-daughter, Tara (Alfred) Bettis Chestang, Mt. Vernon, Al., two brothers, Aubrey Lee (Jackie) Perkins, Mobile, Al, and Harry (Margaret) Perkins, Mobile, Al., two sisters, Lladella (Myron) Hill, Prichard, Al and Sadie (Clarence) Abrams, Mobile, Al., 21 grandchildren, 19 great-grandchildren, and a host of nieces, nephews, and other relatives. Visitation: Friday, March 22, 2019 - 5 - 8 p.m.
Celebration of Life: Saturday, March 23, 2019 - 11:00 a.m.
19130 Pine Grove Church Rd. Interment: Roper Cemetery, Hwy 43, Mt. Vernon, Al. To send flowers in memory of Lathel Pettitt Guy, please visit our Heartfelt Sympathies Store. We encourage you to share your most beloved memories of Lathel here, so that the family and other loved ones can always see it. You can upload cherished photographs, or share your favorite stories, and can even comment on those shared by others. Provide comfort for the family of Lathel Pettitt Guy by sending flowers.